Our Greenville location is located at 6360 Greenville Rd in Greenville, MI. We operate a small convenience store and gas station, Pacific Pride commercial fuel site, accounting and customer service offices, and distribution for propane and bulk fuels from this site. The retail gas station is open from 6am - 10pm M-F and 7am-10pm weekends. Our gas station also offers propane cylinder and motorhome filling during daylight hours 7 days a week. 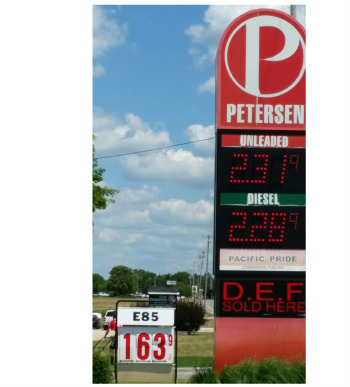 The station carries Gasoline and diesel fuel, kerosene, off road diesel, and ethanol blended gasoline of E20, E30, E40, E85.and Rec gas. Our convenience store carries a full line of snacks along with beer & wine. The customer service office is open weekdays from 7am - 5:30pm for payments, fuel orders, new account setup, and any other customer needs. Packaged oil and equipment purchased can also be made from our customer service office.